After many qualified students competed to represent their school, the CHS student body has cast their votes and appointed class and ASB presidents for the 2017-18 school year with Sebastian Hendricks representing the sophomore class, Juliana Smith representing the junior class and Tara Jones representing the senior class, alongside newly appointed ASB president Diego Cabrera. The election allows students to choose capable, enthusiastic and determined group of students who are ready to take action immediately. Jones, a first-time leadership position holder, wowed her class with her humorous yet compelling campaign video. Campaign videos are a way for the candidates’ names to be heard and capture the attention of other students and one of few mandatory elements of the election, but Jones went above and beyond, swarming the school with stickers and posters to make herself known. “I thought this was a great way to start conversations with possible voters, and it is simple advertising!” Jones says. Laughlin, another elect without previous experience, charmed students with her charisma. Jones and Laughlin have already started to become familiar with ASB. “I think once I see how ASB runs their meetings, I can see how I can implement the changes I need to make,” Jones says. The new ASB president worked hard for his position after a loss last year. 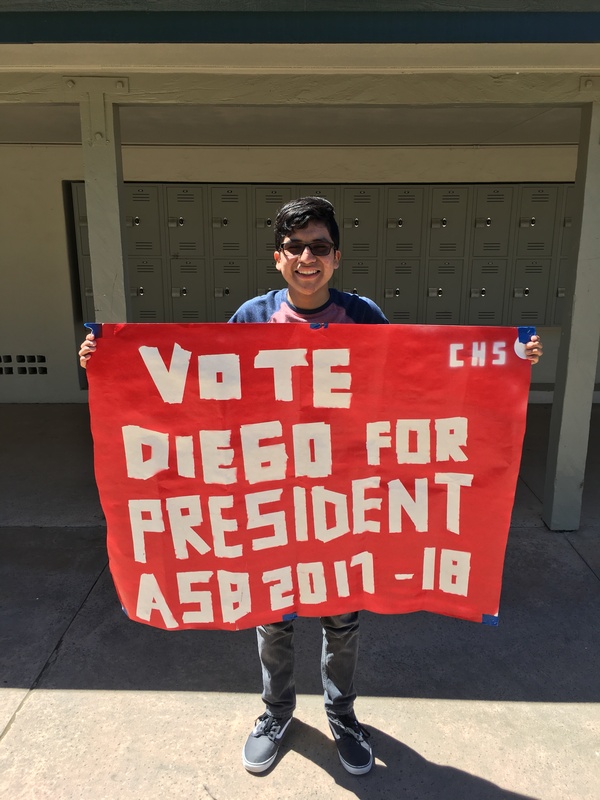 Now, Diego Cabrera is more motivated than ever to improve the spirit and dynamic of Carmel High. Cabrera has already started planning ideas for the upcoming school year. Cabrera has shown immense dedication to leadership since before coming to CHS, but had some fierce competitors for the job, including juniors Gianluca Dourous and Coral Barrett. Cabrera’s dedication to the student body has definitely caught the attention of many. Other leadership positions will be filled by junior Gabrielle Obligacion as ASB vice president, junior Sophia Collins as ASB secretary and junior David Huh as ASB treasurer. As for class representatives, Jessica Hwang will hold the position as senior class secretary, with Sarah Saito as junior class vice president. As for the sophomore class, Marcus Lo will be vice president with Bryn Womble as sophomore secretary. Junior Nick Krueger will be the commissioner for spirit, junior Paige Hartley for recognition, Raen Gallup for publicity and Jessica Pavloff for athletics. Commissioners are yet to be determined for rallies, lunchtime activities, social activities, historian and junior class secretary. For students interested in representing, there will be an informational meeting during office hours May 16 in Room 38.